Destilería Serrallés is the birthplace of Premium Puerto Rican Rum, with a heritage dating back to 1865. Today, Destilería Serrallés is one of the largest rum producers in the world. Currently, the Serrallés manufacturing process is characterized by a multiple distillation system and carbon-active filtration which produces a clean and pure rum. The artisan aging in American white oak casks and careful blending are exclusive recipes of the Serrallés family that have been perfected through six generations. The traditional mastery of blending the best rum reserves in their true environment, space and time guarantee the continuity of its results: a portfolio of premium rums with distinctive bouquets and perfect balance. Serrallés has invested significant time, knowledge, and resources in making the distillery one of the cleanest and greenest in the spirits industry. 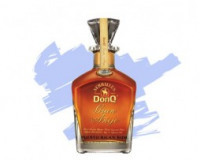 The Don Q brand is named for Don Quixote, the famous literary character from the family’s favorite novel. Just as Don Quixote represents the search for a perfect world, Don Q signifies the family’s quest for perfection in rum.